According to most biology textbooks, the main organizing principle of the cell is the membrane. Lipid bilayers wrap organelles including the nucleus, mitochondria and the endoplasmic reticulum to keep some proteins in and others out. The rest of a cell’s internal machinery has been depicted as floating awash in the cytoplasm, with proteins occasionally running into binding partners, substrates and small-molecule drugs. 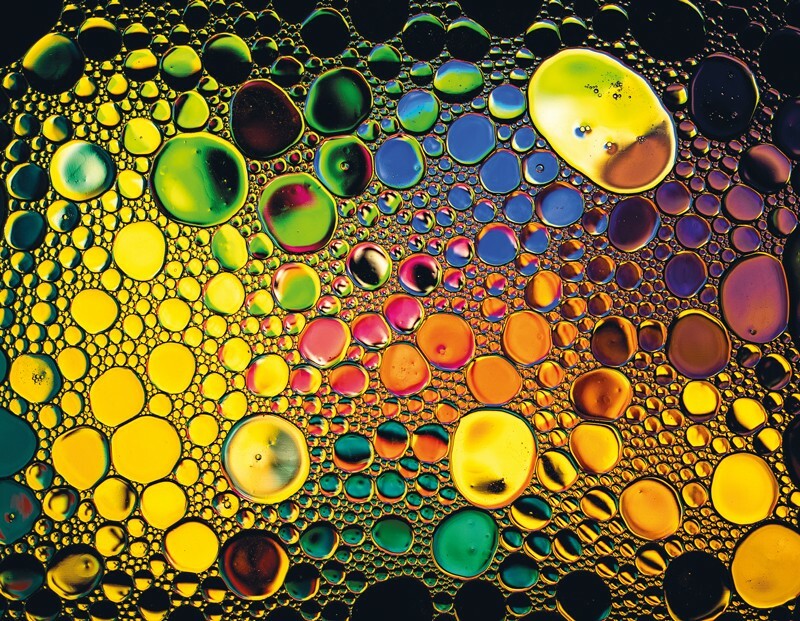 Now, a growing appreciation for the importance of biomolecular condensates — transient liquid-like droplets made up of proteins and RNA — is forcing cell biologists to rethink this model. Preliminary evidence already suggests that these so-called membraneless organelles, which form through a process called liquid–liquid phase separation, are important in health and disease. They seem to act as crucibles to speed up reactions between their component proteins in some cases, and as a means of keeping reactants away from one another in others. And mutations that perturb the assembly and disassembly of these structures appear to affect the course of neurodegenerative diseases, cancer and more. There is a long list of open questions for drug hunters to consider. What happens if a prioritized target clusters in transient biomolecular condensates? Does the diffusion of drugs into these membraneless organelles affect exposure? And, can small molecules sometimes have unintended and harmful effects on condensate formation and disassembly? “It's not quite cosmology, but there are a lot of unknowns,” says Cliff Brangwynne, a biophysical engineer at Princeton University whose work has helped to revitalize interest in liquid–liquid phase separation and membraneless organelles. “You don't want to turn your back on this stuff and ignore it because it might sneak up behind you,” adds Derek Lowe, a medicinal chemist at the Novartis Institutes for BioMedical Research who is following this space closely. Membraneless organelles have been popping up in the literature for over a century. Edmund Beecher Wilson, a cell biology pioneer, described the widespread existence of liquid-like organelles in a review in Science in 1899, and these structures bespeckle the drawings of cells throughout the decades. But without a clear understanding of the role of these structures in living cells or the biophysics of their assembly, few researchers have paid them much heed. That started changing about a decade ago. When Brangwynne, who was then doing a post doc at the Max Planck Institute, and his supervisor Tony Hyman started to peer at embryos of the worm Caenorhabditis elegans through the microscope, their initial aim was to understand the origins of P granules, clusters of RNA and RNA-binding proteins that were poorly biophysically characterized at the time. But what they found was that P granules behaved like oil droplets in vinaigrette, fusing with one another, dripping and rapidly condensing and dissolving in and out of solution. They reported this work in Science in 2009, in a landmark paper that applied the concept of phase separation to a specific membraneless organelle. Two years later Brangwynne and colleagues reported in Proceedings of the National Academy of Sciences that nucleoli, structures that form in the nucleus with a key role in ribosome assembly, have similar liquid-like properties and reliance on phase separation. Soon after, researchers started to spot these phenomena everywhere, including in Cajal bodies, nuclear speckles, stress granules, RNA transport granules and more (Fig. 1). Fig. 1 | Membraneless organelles in the cell. A growing number of biomolecular condensates have been identified in the cytoplasm and nucleus. Not all compartments are present in all cell types. Gem, Gemini of Cajal body; OPT, OCT1/PTF/transcription; PcG, Polycomb group; PML, promyelocytic leukaemia. Reproduced from Nat. Rev. Mol. Cell Biol. 18, 285–298; 2017, Springer Nature Limited. At the same time, researchers were making headway in deciphering the biophysical underpinnings of the rapid formation and dissolution of these structures. In 2012, for example, UT Southwestern Medical Center biophysicist Michael Rosen and colleagues described in Nature how multivalent macromolecules that can bind multiple partners enable sharp liquid–liquid phase separations and the rapid condensation of micrometre-sized liquid-like droplets. Subsequent work has shown that the multivalent macromolecules in play include proteins with intrinsically disordered regions (IDRs), RNA molecules and more. Disease associations started to crystallize shortly afterwards. Paul Taylor, a neurologist at St. Jude Children’s Research Hospital, was working to understand the genetics of neurodegenerative diseases, and reported in 2013 in Nature that conserved mutations in the IDRs of HNRNPA2B1 and HNRNPA1 were associated with amyotrophic lateral sclerosis (ALS). When one of Taylor’s students subsequently realized that purified HNRNPA1 behaves bizarrely in the test tube — flitting reversibly in and out solution — Taylor too found himself captivated by the biology of membraneless organelles. By 2015, a full renaissance was underway. That year, five papers independently demonstrated that IDRs were crucial to the phase transitions of biomolecular condensates. “All of a sudden there was enormous interest in it. It's just been explosive,” says Brangwynne. Because IDRs are widespread throughout the proteome, these findings have captured the imagination of cell biologists everywhere, adds Taylor. “Many scientists suddenly realized that their favorite proteins undergo biologically relevant phase transitions and they hadn’t even realized it,” he adds. Research on the importance of phase transitions in ALS, especially, has taken off. Hyman, a co-founder of Dewpoint, reported with colleagues that FUS forms membraneless organelles at sites of DNA damage and in the cytoplasm upon stress, and that mutations in FUS that are linked with ALS lead to aberrant phase transitions. Taylor reported with colleagues that HNRNPA1 also undergoes liquid–liquid phase separation, and that ALS-related mutations in this protein can also affect liquid–liquid phase separation. ALS-related mutations that affect the dynamics of membraneless organelle formation, it seems, make some of these structures stickier and more viscous than they would otherwise be. This, in turn, appears to trigger the fibrillization of the inclusion bodies that are a hallmark of disease. Taylor estimates that disturbances in phase transitions account for more than 90% of ALS cases. Other neurodegenerative diseases might also be linked to liquid–liquid phase separation. In 2017, Ankur Jain and Ron Vale proposed that a broad set of repeat expansion disorders — including Huntington disease and muscular dystrophy as well as ALS — might involve aberrant RNA droplet formation. And in 2018, Taylor and colleagues reported that soluble tau species, a key culprit in Alzheimer disease, can form condensates. Cancer, too, seems to involve membraneless organelle biology. In 2016, Massachusetts General Hospital pathologist Miguel Rivera and colleagues reported that phase transition mechanisms might establish and maintain oncogenic gene regulatory programmes in Ewing sarcoma. And last year, structural biologist Tanja Mittag, at St. Jude Children's Research Hospital, showed that the tumour suppressor protein SPOP is active inside membraneless organelles. Cancer-related SPOP mutations, moreover, interfere with the protein’s ability to phase separate, colocalize with its substrate and suppress tumour formation. When it comes to drug development programmes, oncology could offer the easiest path to applications. Whereas medicinal chemists may struggle to restore the finely tuned balances of condensate formation in neurodegenerative settings, they can focus on wreaking havoc with the system to kill cancer cells. “I'm not proud of this as a medicinal chemist, but we have a much better chance of messing stuff up than we have of making it work better,” says Lowe. Transcription factors and super-enhancers seem to rely on liquid–liquid phase separation biology to control gene expression, for example, providing one example of how this could play out. “If you just want to go in there and throw a monkey wrench into transcription by messing up condensate behaviour, oncology would be the place to do it,” says Lowe. Beyond neurodegeneration and cancer, infectious diseases and autoimmunity are also worth watching, says Taylor. Infectious disease agents can for example exploit biomolecular condensates to facilitate their replication cycles, he explains, and phase transitions seem to control signalling cascades that modulate innate immunity. “The proof of concept is not there yet to the same extent that it is in neurodegeneration and cancer, but I think it’s coming down the pike,” he says. Some researchers still have some doubts. Will work done with purified condensates in in vitro systems translate into in vivo models? Are the disease associations causal? And, could condensates just be biophysical artifacts with no real role, rather than critical cellular structures? Hyman and Rosen trod carefully in a 2017 review of membraneless organelles. “We do not understand in most cases what biochemical or cellular functions uniquely emerge from organizing molecules into such structures,” they wrote with colleagues. “Phenotypes resulting from the disruption of condensates are relatively subtle and the structures do not appear to be essential for the viability of cells or organisms.” The field, in other words, is still young. But Taylor is convinced about the pathophysiological importance of condensates, even if he concedes that the path from this new organizational paradigm to new drugs remains fraught. “We are at this weird point in the field where the concepts and principles have emerged, but precise targets are as yet not clear,” says Taylor. He nevertheless points to two main ways forward. On the one hand, researchers can hunt for small molecules that will bind directly to the proteins that make up the biomolecular condensates themselves — potentially stabilizing or destabilizing these proteins to tweak their ability to form clusters, for example. However, many of these components are proteins with IDRs, which have long eluded small-molecule discovery work. Alternatively, researchers can target the upstream regulatory machinery that controls condensate biology. ATPases, helicases and ubiquitinases seem critical to liquid–liquid phase dynamics, as do proteins that control the post-translational modification of condensate members. It remains to be seen whether any of these targets are selective enough to control only the dynamics of disease-associated condensates, and whether redundant regulatory mechanisms might complicate matters. Taylor’s hopes are nevertheless high. “Both of those are viable strategies, but it's the second strategy that I would place my money on,” he says. Dewpoint is keeping its options open. “Depending on the specific therapeutic situation and the specific target and the specific condensate, it'll be valuable to have a whole range of approaches at our disposal,” says Murcko. Even IDRs — in everything from kinases to transcription factors — are on the table, he adds. For more than 15 years, Murcko has had a folder on his computer for papers about shape-shifting proteins with IDRs. “Every single time I would see a paper on this topic I would read it and I would get mad because I didn't really understand what these proteins were doing,” says Murcko, who has harnessed protein structure to design better drugs throughout his career. “Now, for the first time, we are getting a clear sense of a big part of what these IDRs are doing,” he adds. IDRs, with all the structure of limp spaghetti, it turns out are multivalent actors that can bind to other proteins and RNAs around them to nucleate liquid-like condensates when the conditions are just right. The hunt for small molecules that can interact with amorphous IDR regions is likely to remain frustrating. “It is beastly hard,” says Lowe, “enough to give the man the willies.” But Murcko points to encouraging proof-of-concept data as cause for optimism. In 2016, for example, researchers identified a small-molecule drug candidate that binds to the disordered region of the androgen receptor. Regardless of what targets drug hunters choose to go after, they are going to need a wide array of tools at their disposal. Not only will they have to be able to individually study the protein components and the biophysics of condensates, but they’ll also have to use advanced imaging techniques to screen for small molecules that can modulate these processes in relevant cells. “Unless you really have thought pretty carefully about a wide range of technologies to tackle these problems, you are in for a world of hurt, full of false readings, artifacts and outright failures,” says Murcko. Established technologies such as cross-linking mass spectrometry are being used to see how single amino acid changes to condensate components affect protein structure, and high-content imaging can be used to watch membraneless organelles form and to screen for small molecules that perturb these dynamics. But new techniques are also needed. Brangwynne meanwhile has focused on developing optogenetic tools that can control condensate formation inside the cell. OptoDroplets, Corelets and CasDrop combine the IDR regions of condensate components with light-dependent oligomerization domains from other proteins. By shining light onto cells that express these constructs, researchers can essentially force oligomerization and the resulting condensate formation. “No one's really thinking quantitatively about the rules that govern the organization inside our cells. They just see some puncta and call it phase separation, and I think there's a real danger with that,” says Brangwynne. “What this technology does is it allows you to quantitatively map phase diagrams in living cells,” he says. Taylor has built on the OptoDroplet format to create OptoGranules, another way to initiate membraneless organelle assembly. Such tools should help researchers to figure out the functions of condensates. And for drug hunters who want to find small molecules that can control condensate biology, they could provide a way to assess whether small molecules are making a difference to phase separation dynamics in cells. 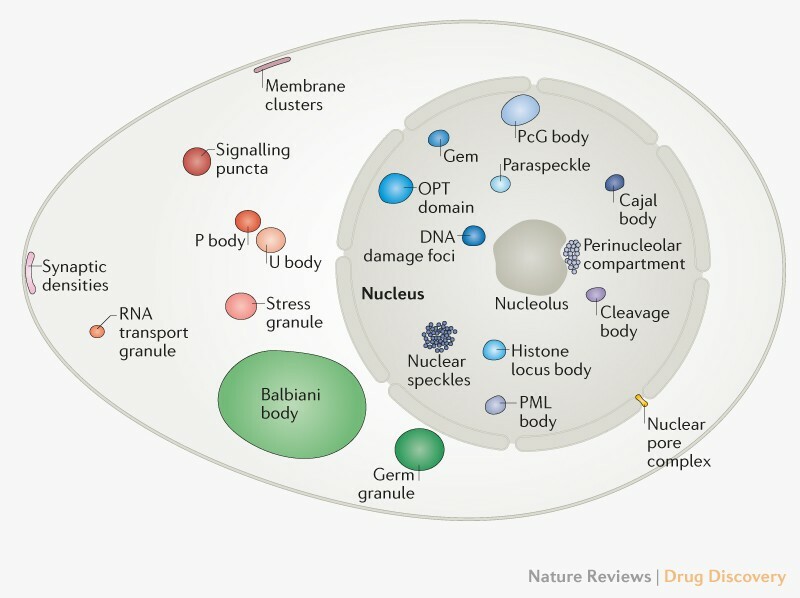 Drug hunters have never had a great grasp on where exactly a small molecule goes once it penetrates into a cell, and how it finds a free-floating target within the chaos of the cytoplasm. Now, these new insights into the organizational principles of cells suggest that things might be even more complicated than previously anticipated. “Not only would you have to track your compounds in the cell, you’d also have to track them into locations that are so small you need advanced imaging techniques just to convince yourself they exist,” says Lowe. Researchers have their work cut out for them to get a better grasp on what this all might mean for drug discovery. What targets can be found in membraneless organelles? How, if at all, do biocondensates directly or indirectly impact the activity of various pathways? Do small molecules traffic in and out these structures, and does this impact exposure? Can small molecules meaningfully modulate condensate formation and function? None of this work will be straightforward, given the ephemeral and microscopic nature of these organelles. Depending on how things play out, this new field could also open up new avenues in toxicity testing. “My personal opinion is that as the field matures, no drug company should feel comfortable taking a drug candidate into clinical trials unless they fully understood what effect that drug candidate has on cellular condensates,” says Murcko.